Part of my mission as a mom is to pass down arcane life skills and information to my son, so that when he’s a grown man, he will be fully prepared and confident to handle whatever surprises life throws at him. Of course, passing along esoteric, obscure, or old-fashioned skills most often goes hand-in-hand with passing along family stories and traditions. So, it’s not all for nothing. A few weeks ago, EGGS were on my mind. I don’t know why this was the time for eggs, maybe, because it was nearing the Easter holiday, a time when the media bombards us with bunnies, chicks and eggs. Regardless, I decided that my 13-year-old son needed to know how to prepare a soft-boiled egg (also called a soft-cooked egg). He could cook a scrambled egg, he could prepare an omelette, and he could fry an egg. However, he’d never learned to soft-boil an egg. And, I determined, if I was getting into soft-boiled eggs, I might as well get into egg cups. After all, you never know in life when you might meet-up with an egg cup. And, if you’ve never encountered one before, an uncracked egg sitting in an egg cup waiting to be eaten can be daunting. 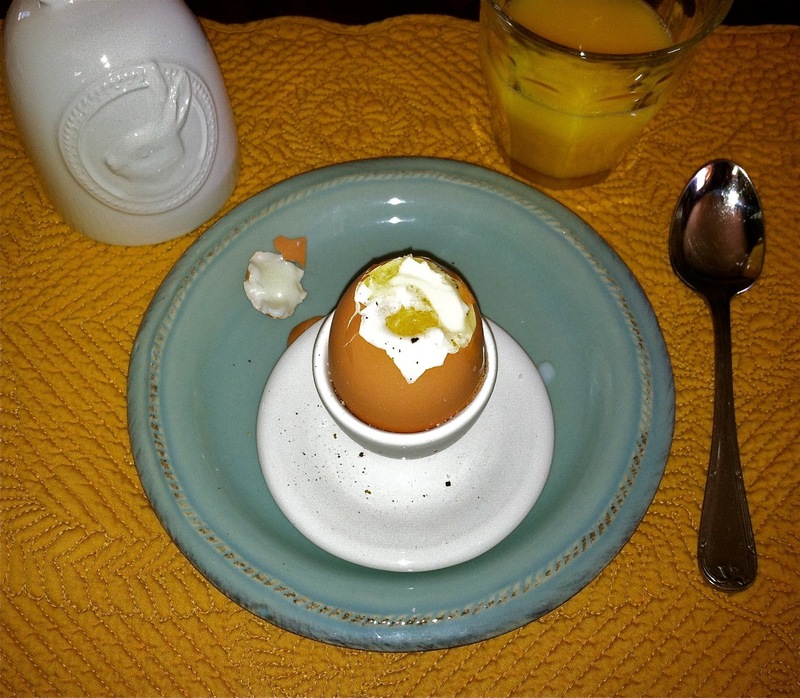 Now, if you’re from the UK, or many parts of Europe where using an egg cup is more common, then, you may feel I’m a bit out of line for calling an egg cup “arcane.” However, the fact is, egg cups are few and far between here in the US. 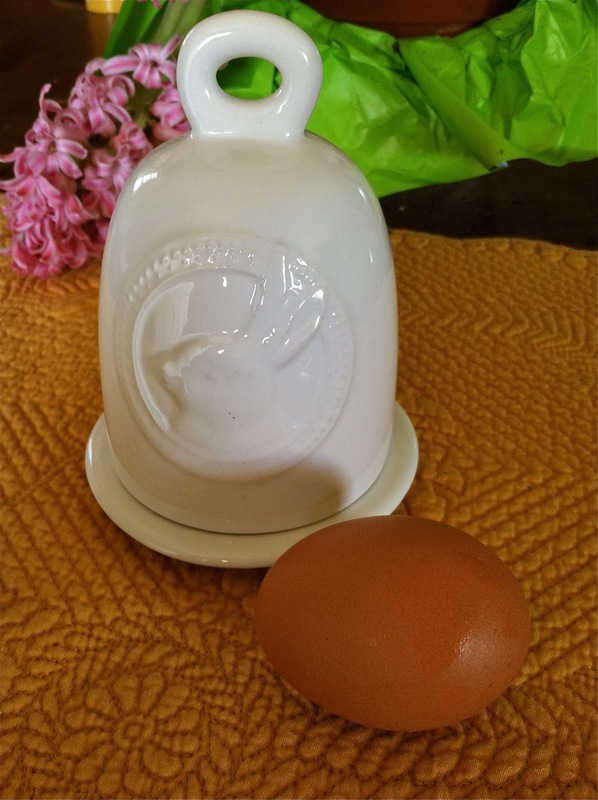 So, about the time I began planning my egg tutorial, low-and-behold, Pottery Barn was having a sale… their spring catalogue featured the “Cameo Egg Cloche;” a white, glazed stoneware egg cup, with a little attached dish on the bottom, and a bunny “cameo” imprint on a separate cloche cover. Better still, each was on sale for less than six dollars. How could I go wrong? I ordered three, one for me, one for my husband, and one for my son. We’d make it a family affair, eating soft-boiled eggs out of our new egg cups. Of course, even with the best-laid plans, nothing ever goes quite as expected. After the initial egg cup presentations were made to my family, when the appointed day for egg cup lessons came to be, my husband was nowhere to be found. Regardless, my son showed a remarkable amount of patience and poise as he tolerated my soft-boiled egg and egg cup tutorials. I told him stories about how, when I was a girl, I ate soft-boiled eggs at Grandma’s house. I remember Grandma’s early 20th-century kitchen, with the painted, sage-green cabinets, linoleum floor, enameled sink and drainboard, white gas-range, and her red transferware. Inside each transferware bowl was a depiction of a past-century couple under a tree. I’d watch Grandma boil the egg, cool it under running water – not for too long, just until cool enough to hold – then, hit the cooked shell with the back of a knife around the top before carefully removing the “lid.” Next, with a teaspoon, in one motion, she’d carefully scoop-out the egg from the shell (like magic, I thought), and place the loosened egg in the transferware bowl. My egg would be chopped with a spoon, before salted and peppered. I daresay, there would be a pat of butter added as well. Sometimes, there would be toast with butter and jelly on the side. 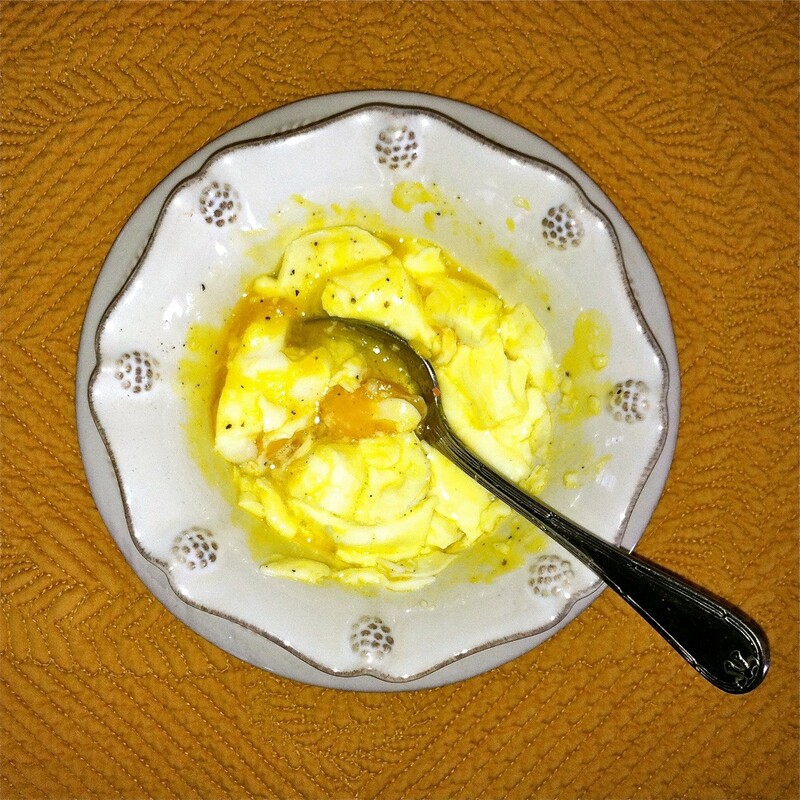 I’d eat my delicious egg, whites cooked, yolk still partially runny, until I reached the bottom of the bowl where I’d discover the garden scene. Grandma ate hers with little pieces of buttered toast mixed in with the runny egg. When we finished, Grandma and I would make-up a story about the garden couple in the bottom of the bowl. We started by placing an egg in cold water inside a saucepan. Then, we heated the pan until the water came to a full boil. After two to three minutes, we removed the egg with a slotted spoon and cooled the egg under running cool water… just until it was cool enough to touch (still quite warm). 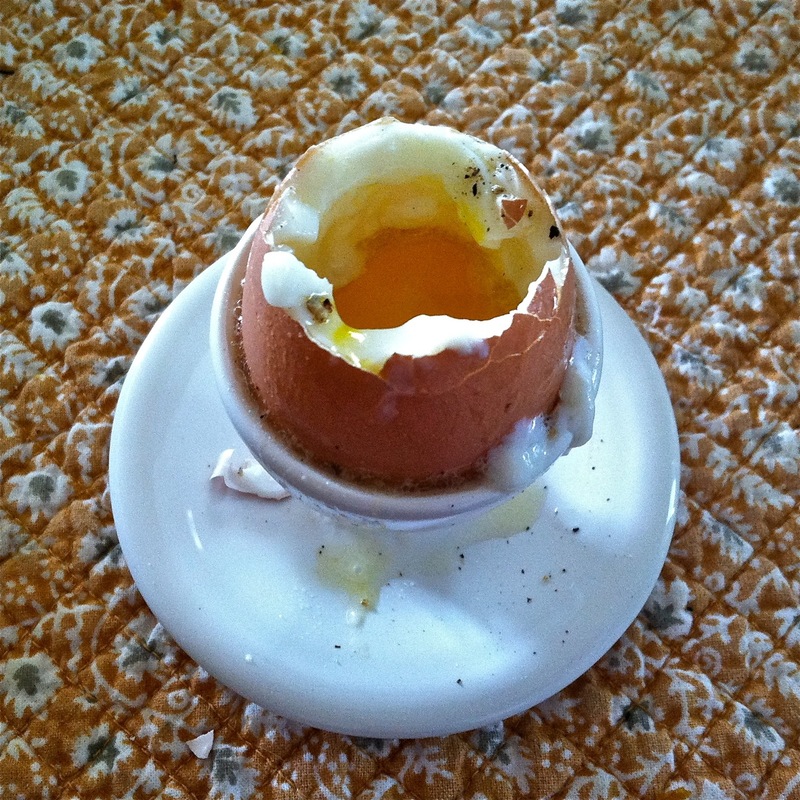 Then, we placed the egg into the egg cup. Using the back of a knife, we hit the top side of the egg-shell with a sharp rap to crack the shell. We followed by pushing the knife tip into the egg and slicing across the top, until the “lid” fell off to reveal the interior of the egg. Our first peek inside… here’s where we learned whether we’d gotten it right in terms of cooking time! We concluded that I prefer my egg slightly runny and my son prefers his egg cooked a little closer to hard-boiled, so we needed to adjust cooking and cooling times appropriately. All that was left to do was season the egg interior with salt and pepper (if desired), carefully dip the spoon in (so as not to slosh out all the egg on the first bite)… and enjoy! Dipping slivers of toast made from my pumpkin bread was a tasty treat as well. Ummm… we won’t mention here that if one finds his or her egg to be slightly undercooked, and if one decides to put the egg with “lid” removed but still in the shell, into the microwave for a few additional seconds, then perhaps, when one finally inserts his or her spoon into the boiled-then-microwaved egg… there will be an EGGSPLOSION. So, after a few days and a dozen eggs or so, armed with a bit of new arcane knowledge and skill, my son is ready to take-on a world full of eggs and egg cups. 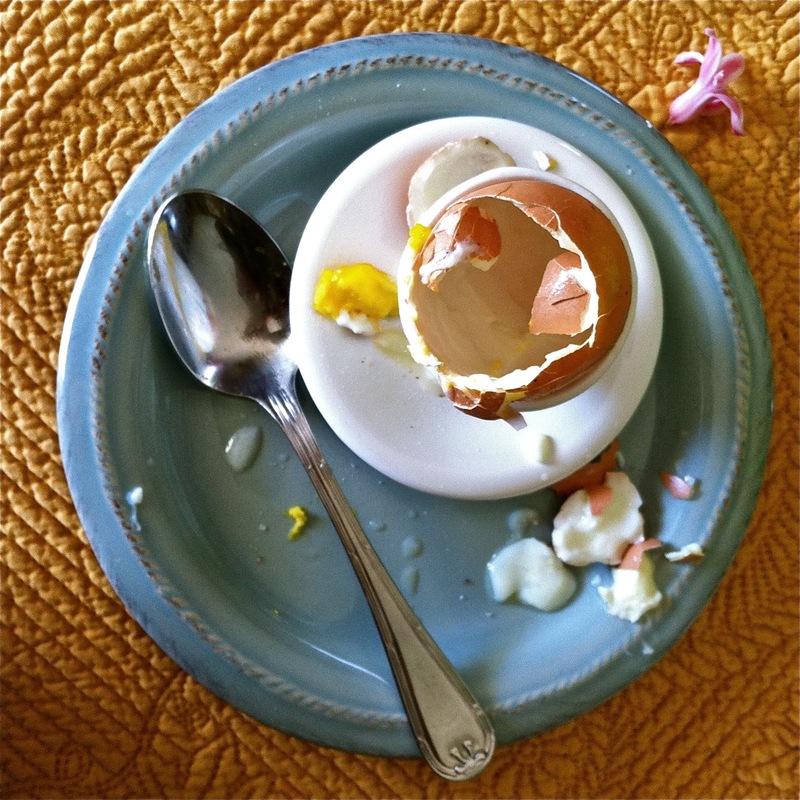 An egg cup is little dish or bowl specifically designed to serve a boiled or cooked egg. Most egg cups are single cups on a pedestal. However, a double egg cup may have two sides, one large and one small. 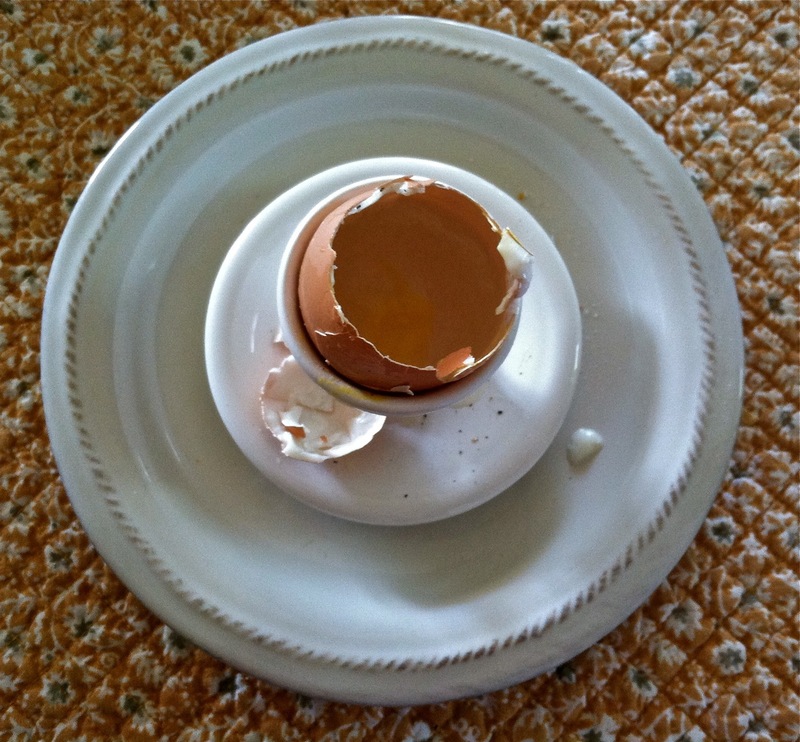 Using a double egg cup, place the large end over the unopened egg to keep the egg warm until it is time to eat. 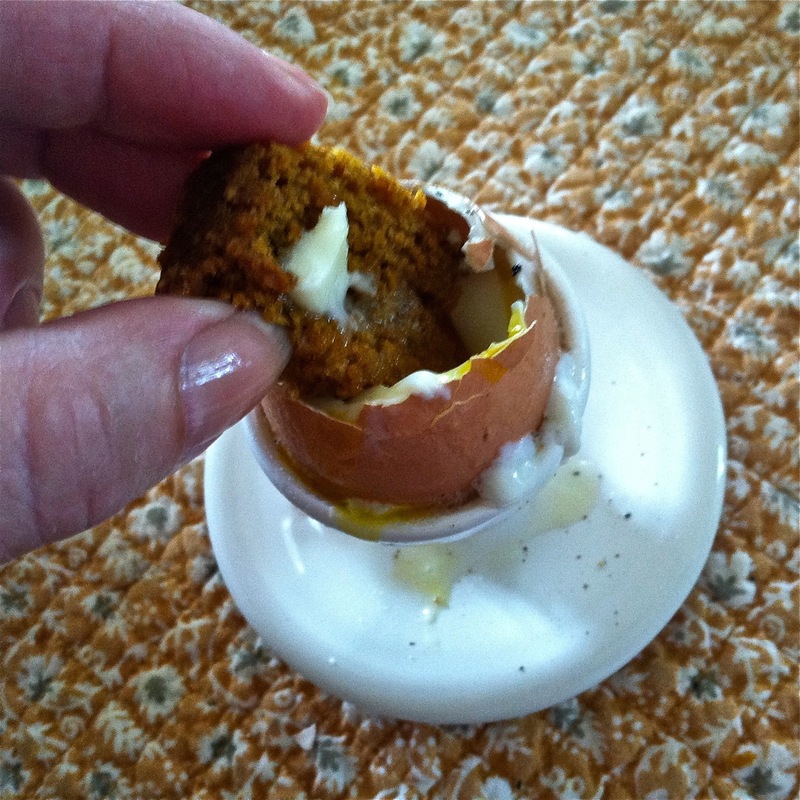 Then, flip over the cup and set the egg into the smaller cup for consummation. During the 1930s, the double egg cup was especially popular; egg was removed from the shell, placed in the big cup, chopped and seasoned with salt and pepper and then eaten right from the big cup. Toast or bread, often sliced into narrow “fingers” dipped into the egg is a favorite treat. 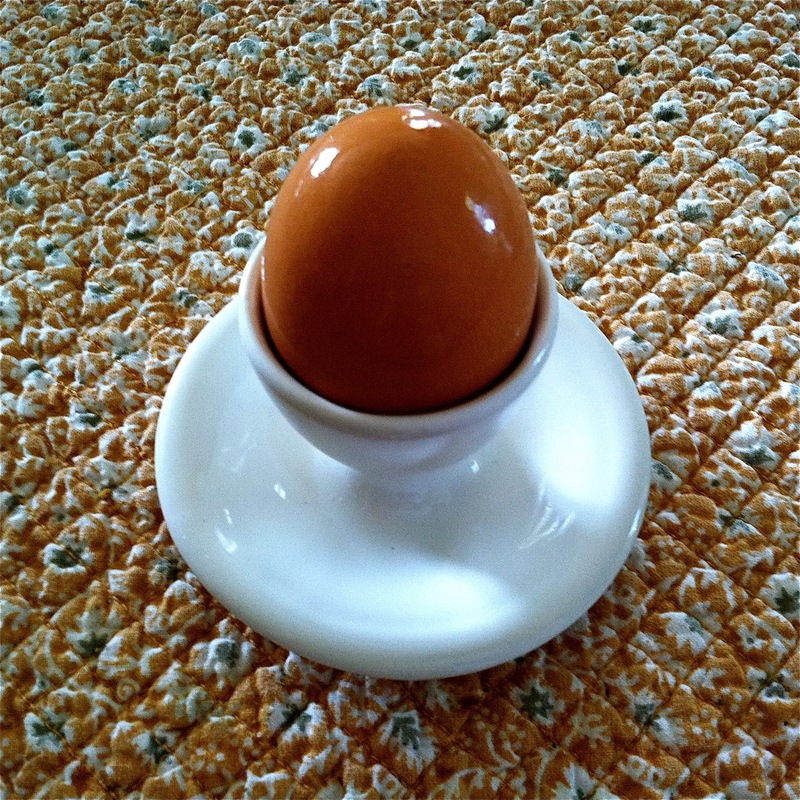 The egg sits with its larger end in the egg cup. A special egg cutter (ACK! who has one of those?) can be used to break open the shell. An egg spoon is made to fit into the egg. Egg cups are most common in the UK, Europe and Canada. Less common in the US. Art depicting egg cups dates as early as 3AD. Actual egg cups were found in ruins of Pompeii dating from 79AD. Prior to 1700, egg cups were made from wood then silver. 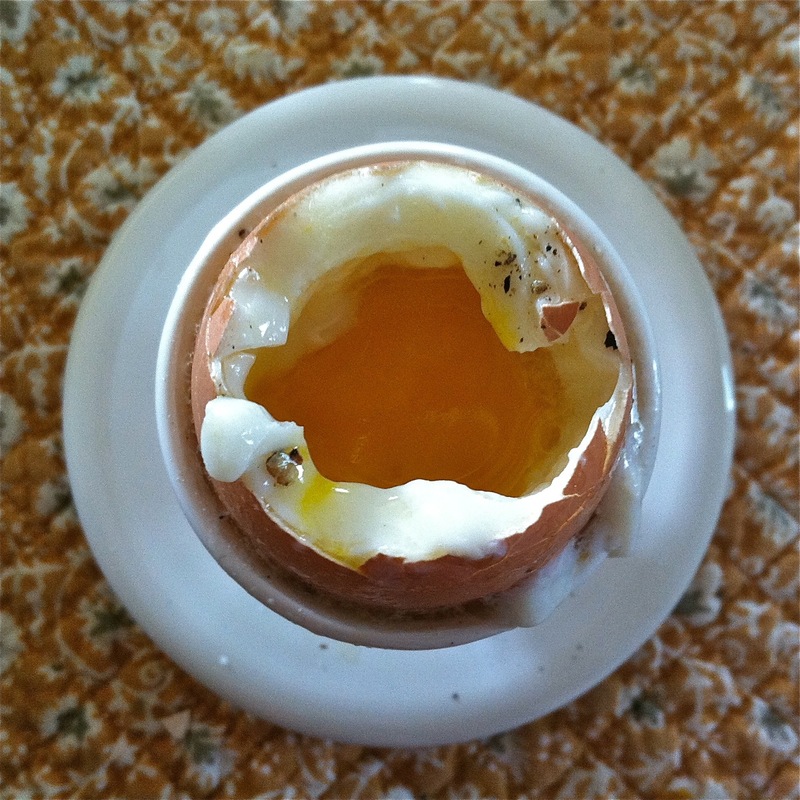 An egg cup may be made of just about any material, form porcelain, to plastic. Often, 1800s egg cups made of silver were gilded inside to prevent sulfur from the egg from staining silver and affecting flavor. 1800s egg spoons were often made of horn, bone or ivory so as not to taint the egg taste. Beginning in the 1930s, egg cups with attached platters were made. People collect egg cups all over the world. Egg cup collecting is called pocillovy. An egg collector is known as a pocillovist.